you will find everything new in the store! Cool Clothes with the TODESKING DESIGN! The "Nekromantik 2" Blu-ray/CD mediabook is coming in fall 2016 from Media Target, Germany. The Extended Cut of Nekromantik 2 was perviously considered lost. It was screened only twice before, the first time for the press and the second time for the public world premiere of "Nekromantik 2" in march 1991. Before the official thearical release, the film was shortend by director Jörg Buttgereit for artistic reasons. The recently rediscovered premiere print is the only surving copy of this version, since the original elemtents are lost. This print was scanned and restored at 2k resoultion in 2016 for this blu-ray edition. - TV doc "Literweise Spielfilmblut"
Jörg Buttgereit’s notorious cult classic "Nekromantik 2", once prosecuted in its native Germany as “gloriying violence”, arrives on Blu-ray/DVD for the first time in the UK - fully uncut! Released 2nd November 2015 from Arrow Video! NEKROMANTIK 2 will see its Blu-ray debut February 10th of 2015 in USA. Following up the release of Jörg Buttgereit’s original NEKROMANTIK, Cult Epics sent along the full details of the upcoming Blu-ray (Code A). Special features: Audio commentary by Buttgereit, co-writer Franz Rodenkirchen and actors Monika M. and Marc Reeder, new introduction by Buttgereit, The Making of NEKROMANTIK 2, photo gallery, Buttgereit trailers, Original motion picture soundtrack (audio), 20th-anniversary live concert performed by Monika M. and friends (video), A MOMENT OF SILENCE AT THE GRAVE OF ED GEIN short film by Buttgereit, “Half Girl—Lemmy, I’m A Feminist” music video by Buttgereit. The first 5,000 Blu-rays and 2,000 DVDs will include new collectible NEKROMANTIK 2 artwork by Johnny Ryan and a necrophilia photo. 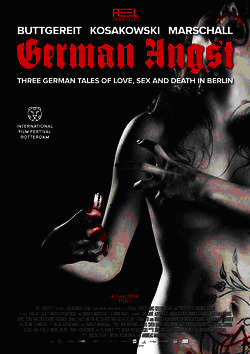 We are very pleased that German Angst will have its World premiere screening at the 44th International Film Festival Rotterdam. Limited edition Blu-ray/DVD copys of "Nekromantik", individually signed by director Jörg Buttgereit, are available on request. Paypal required. To uncover the world exclusive hidden track on the German "Nekromantik" Blu-ray from Media Target choose "Extras" in the main menue, go to "Making of Nekromantik", press the "right" button on your cursor, when the "scissors" appear press "enter". Enjoy never-before-seen "Nekromantik" out-takes from the cutting room floor. Jörg Buttgereits cult movie "Nekromantik" will be coming on Blu-ray in a limited Mediabook from Media Target in Germany in Fall 2014. In Oktober 2014 "Nekromantik" will also be released in England (Arrow Film), USA (Cult Epics) and Japan (New Select). In cooperation with comic artist Martin Trafford I will present the online-comic CAPTAIN BERLIN VERSUS FUKUDA here on my g+ profile. As soon as Martin has finished a new page we will publish it online. 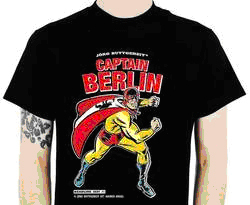 Jörg Buttgereit has licensed the first official CAPTAIN BERLIN T-shirt to the German movie magazine DEADLINE. The limited shirt shows the classic comic cover art by Rainer F. Engel. In the series Berlin Legends PLATOON member Alexandra Droener hosts icons of the Berlin creative scene and legendary subculture activists. in the second edition the guest will be Jörg Buttgereit. This seems to be interesting! Jörg ist putting together films for The Viennale, which is a very serious and well know festival. Don't miss it! It will be much fun. Promised. "THE THING FROM ANOTHER WORLD marks both the beginning and end of my subjectively selected film series. We will present the 1951 original by Christian Nyby as well as John Carpenter’s 1982 remake The Thing, a milestone in analogue special-effect cinema. What lies between is poles apart and includes such different genre gems as Tobe Hooper’s splatter classic The Texas Chainsaw Massacre, the British giant-eye film THE TROLLENBERG TERROR , Japanese monster trash like Uchû daikaijû Girara/The X from Outer Space featuring a huge, extraterrestrial green chicken and Mario Bava’s secret Alien prototype TERRORE NELLO SPAZIO/PLANET OF THE VAMPIRES. You can look forward to staggering mushroom people, chainsaw-brandishing backwoodsman and slimy tentacle monsters. To get you in the right mood, here’s another quote from the end of the trailer for THE HILLS HAVE EYES: “She thought she knew what the world was all about, but nothing prepared her for this!" Because Jörg wanted to have -finally- some vacation days in North Frisia, it happened that he entered the house of the Producer Manfred O. Jelinski. On August, 21st, both joined in for a signing party. Many People had asked lately for signed products, so they had a lot of work, putting their autographs on posters, hardboxes or CDs. Kristina, head of the shop, made some pictures for you:. Premiere of Jörg Buttgereitsnew stageplay "Kannibale und Liebe" : Oktober 21st, 2012 at Schauspiel Dortmund. Jörg Buttgereits new stageplay GREEN FRANKENSTEIN + SEXMONSTER!" is playing 2012 in Dortmund, Germany. In cooperation with comic artist Martin Trafford Jörg will present the online-comic CAPTAIN BERLIN VERSUS FUKUDA here an on his g+ profile. April 2012: Unfortunately the Todesking-Hardboxes are sold out! (We loved that news *g*!) Only the Nekromantik-2-twenty-anniverary-edition is available. That`s the well known edition with the little coffin made of card to build your own location set of the first scene in the film. As seen on the picture below. The church in the background is also available. Constructed by Producer Manfred Jelinski as well, it will be a great decoration for your living grave. 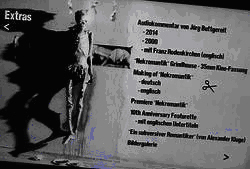 NEKROMANTIK 2 will be released in a limited 20th Anniversary DVD hardbox in April 2011. The DVD is codefree and will play on DVD-players worldwide. The film is uncut and has English, French, Spanish and Italian subtitles. Exclusive Bonus CD with "20th Anniversary Nekro 2 Filmconcert"
(recorded live in January 2011 in Berlin by actress Monika M. and friends), Fridgemagnet, a piece of original "Nekro 2" 16 mm filmstock, 32 page booklet, 2 audiocommentarys in English and German, The Making of "Nekromantik 2" (in English and German language), outtakes, slide show, trailers, 2 Musikclips by Buttgereit, videogame teaser "Game of Death", Buttgereit-homemovie: "New York / Paris" (1986) and much more. The hardbox will be numbered and limited to 666 worldwide. 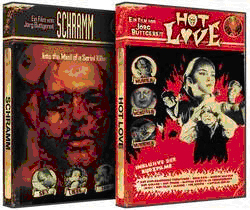 SCHRAMM - INTO THE MIND OF A SERIAL KILLER and HOT LOVE will be released by Media Target distribution in Berlin in limited edition grindhouse-hardboxes in December 2010. The DVDs have no region code and the films are uncut. SCHRAMM will be relased as a double disc with tons of extras including a soundtrack CD. Language is German or Spanish with English and Italian subtitles. The Super 8 short film collection HOT LOVE is in German language with optional English voiceover by Buttgereit. The hardboxes will be numbered and limited to 222 (SCHRAMM) and 111 (HOT LOVE) pieces only.